found in the chapter, calculate the expected return for each company based on the most recent beta. Is the expected return for each company what you would expect? Why or why not? 13.1 Expected Return You want to find the expected return for Honeywell using the CAPM. 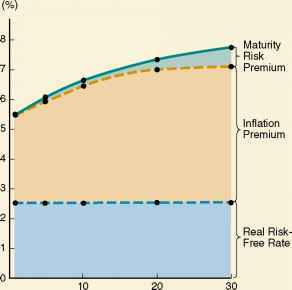 First you need the market risk premium. Go to www.cnnfn.com, follow the "Bonds & Rates" link, and the "Latest Rates" link. Find the current interest rate for three-month Treasury bills. Use the average large-company stock return in Table 12.3 to calculate the market risk premium. Next, go to finance.yahoo.com, enter the ticker symbol HON for Honeywell, and follow the "Profile" link. In the Statistics at a Glance section you will find the beta for Honeywell. What is the expected return for Honeywell using CAPM? What assumptions have you made to arrive at this number? 13.2 Portfolio Beta You have decided to invest in an equally weighted portfolio consisting of American Express, Procter & Gamble, Home Depot, and DuPont and need to find the beta of your portfolio. Go-to finance.yahoo.com and follow the "Global Symbol Lookup" link to find the ticker symbols for each of these companies. Next, go back to finance.yahoo.com, enter one of the ticker symbols and get a stock quote. Follow the "Profile" link to find the beta for this company. You will then need to find the beta for each of the companies. What is the beta for your portfolio? 13.3 Beta Which companies currently have the highest and lowest betas? Go to www.amex.com and follow the "Screening" link. Enter 0 as the maximum beta and enter search. How many stocks currently have a beta less than 0? What is the lowest beta? Go back to the stock screener and enter 3 as the minimum. How many stocks have a beta above 3? What stock has the highest beta? PART FIVE Risk and Return dividend payments over the next year. Now go to www.cnnfn.com, follow the "Bonds & Rates" link, the "Latest Rates" link and find the current interest rate for three-month Treasury bills. Using this information, calculate the expected return on the market using the reward-to-risk ratio. Does this number make sense? Why or why not?